It was good to return to Carrbridge bunkhouse this weekend with all it's quirky features and warm welcoming fire. The bunkhouse felt surprisingly spacious with staggered arrivals throughout the evening. Clare and Katrina arrived traditionally late on as most people were going or had gone to bed (but notably before midnight). The forecast was very good for Saturday and most people were off early to make the most of it. 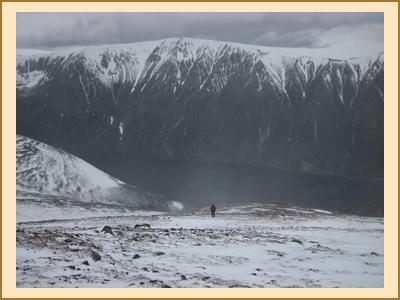 Mike and Fiona cycled into Glen Einich and scrambled up to the most easterly Munro top of Braeriach via a little ridge to its south west before successfully navigating in a white out to Einich Cairn and making a hasty retreat downhill. Pete and Sara also visited Braeriach heading in from the sugar bowl car park via the Chalamain gap. Apart from an hour of windy snow showers mid ascent, the ascent was very pleasent and sunny, with great views. Lunch was enjoyed at a, surprisingly, very calm, clear summit. 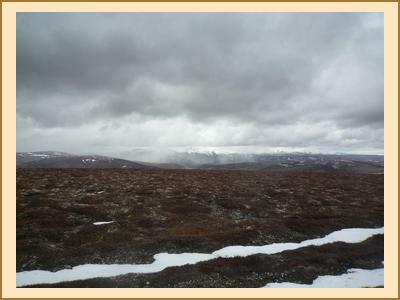 Alan H managed to avoid the bursts of bad weather heading over towards Tomintoul to do a Corbett, Carn Ealasaid. And Clare and Katrina headed west and tackled Creag Meagaigh, Stobin the west Poite Coire Ardair and Carn Liath, partly in freezing cold windy white out conditions but with some welcome clear spells as well. Everyone else (Alison F, Aga, Ken, Fiona C, Adam, and Gill) headed into Bynack More and enjoyed a clear summit with views along the way. It seems lots of other people had decided to venture up the same hill making it a very sociable trip, followed by browsing in the gear shops in Aviemore. Clare had to leave on Saturday night but helped the rest of us mark Katrina's birthday with a surprise cake and candles. We even sang quite a tuneful round of "Happy Birthday". The weather forecast for Sunday was awful and everyone either headed home or to the Cairngorm Mountain Sports cafe.